The club was formed in 1889 when the towns two teams, Crook FC and Crook Excelsior merged to form Crook Town. Millfield was used as their home ground but as it belonged to Crook Rugby club, they had first priority over its use. When the rugby club was at home Crook town had to play their home fixtures at Dawson Street Cricket ground home of Crook Cricket Club who would play a major part in the history of Crook Town. The driving force behind the club was Dr William Ormand a local GP who himself was a keen footballer. For the first four seasons of their existence Crook Town played only friendlies but they entered their first cup competition in 1889 playing in the Durham Challenge Cup beating Etherly 4-1. In 1894 the club were taken over by Crook Cricket Club who insisted that to drive the club forward they must enter a competitive League. An application was made to join the Auckland & District League which was accepted and the clubs first competitive league game was played on the 15th August 1894 which ended in a 1-1 draw with Shildon United. In 1895 the club moved home to the Bankfoot sports ground at Peases West which coincided with their best ever league position in the Auckland & District League finishing runners Up. 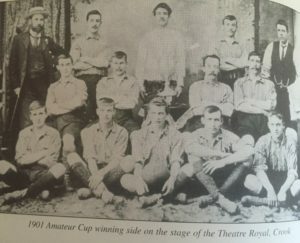 The 1896/97 season saw the club competing in the Northern League for the first time. After a successful application the club started with an outstanding win 4-1 over Darlington St Augustines who previously had been the Northern League Champions on the 26th September 1896. However the season proved to be a steep learning curve with the club finishing 3rd bottom in its first season. That season also saw Crook make its first FA Amateur Cup Match. The 1897/98 season proved full of controversy. Despite the club making its first appearance in the FA Cup, they finished bottom of the league and with the northern League have two divisions with a play off system in place the bottom two of the 1st Division played the top two of the 2nd Division. However, due to a smallpox outbreak in Middlesbrough Crook could not complete their league program so the club refused to take part in the play offs and as two of the clubs involved were based in the Teeside area, the playoff did not in fact take place so there was no promotion or relegation that season. In 1898 the club purchased Millfield for a princely sum of £625 but this did not herald an up turn in the clubs fortunes as they again finished bottom of the league. As a number of clubs either moved leagues or turned professional that year, the play offs were again scrapped with no promotion or relegation for the second season running. 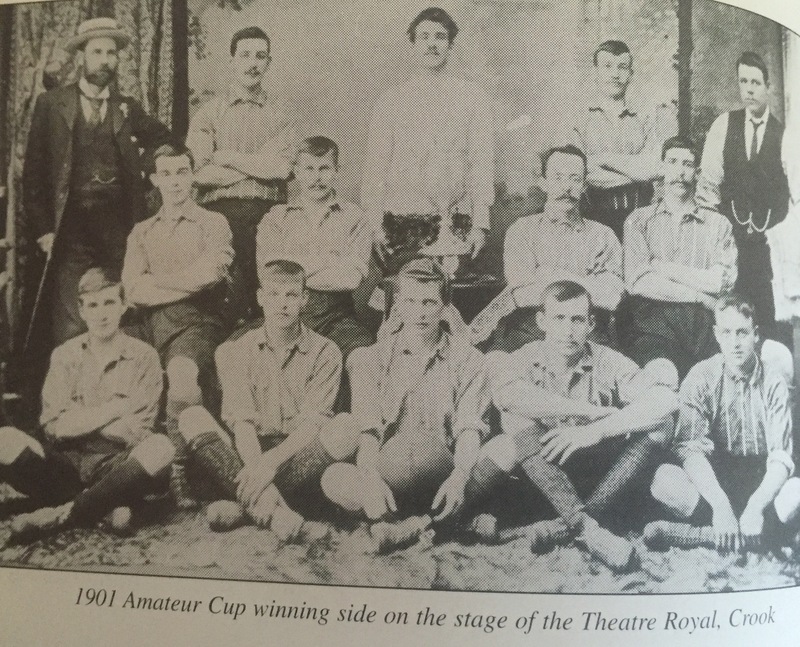 In the 1899/90 Crook drew Kings Lynn Away in the FA Amateur Cup which in its day was a formidable journey. In fact the club decided that it could not afford the expense of such a journey so they had to pull out. Kings Lynn would not be so lucky the next time the clubs met!. The 1900/01 season proved to be the clubs most successful since joining the Northern League with them finishing 5th in the league. However the FA Amateur Cup proved to be the highlight of the season. After defeating the “old enemy” Bishop Auckland 2-0 in the semi finals at Feethams they met Kings Lynn in the final, the team which they could not afford to travel to in the previous season. The final was played at Dove Court in Essex with the game finishing 1-1. The replay was played at Ipswich 7 days later in torrential conditions with the Crook team adapting better and running out 3-0 winners to lift their first FA Amateur Cup, a trophy that would become quite familiar to Crook Town and its players through the 50’s and 60’s. Following the great expense to the club of the previous seasons FA Amateur Cup win, the club could not afford to enter the following seasons FA Cup competition and surprisingly lost in their first round game in defense of their FA Amateur Cup losing 3-0 to Derby Hills Ivanhoe. Their league campaign that season was also a disappointment as they finished 44th Bottom in the Northern League.